Victoria is blessed with great wine-making weather. We are committed to provide the most comfortable Melbourne Wine Tours. The state is home to over 800 wineries all of which have a marvelous and unique experience to offer. An outing away from the maddening crowd of the city will open your senses up to the unique wine experience that can only be found in Melbourne. There is just so much to see. The Sprawling wineries in the lush green Yarra Valley offer you crisp fresh air and well-crafted, long lasting wines. A smaller tour can get you a proper taste of the Hill-Side wine tasting experience at the Hanging Rock Winery. You can choose the old and rustic Yarra Valley wine region which is the closest to Melbourne. If you are an expert you can travel to the Macedon region with its fine wines and amazing views that will keep you coming back for more. It’s all a matter of choosing the destination. Take your pick and we will take you there! Yes, the magic of Victoria wines can now be experienced in a comfortable, luxurious and convenient way. We offer you a wide variety of chauffeur driven wine tours in Melbourne. We make sure that everything is taken care of while you enjoy the beautiful landscape and lovely wine. 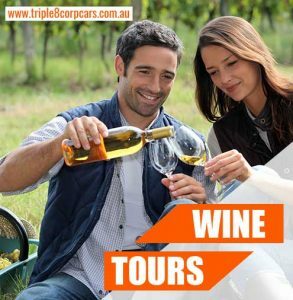 Whether you are a local or a tourist, a worry-free wine tasting experience is right up everyone’s alley and we are glad to offer you a customization wine exploration trip around Melbourne. Whether it is a romantic getaway with a loved one, a sightseeing trip with the family or a nostalgic rendezvous with old friends, come and book with us for a memorable and suitable wine experience. We cater to groups of all sizes and have a huge fleet of cars up on offer. No matter what your requirement our goal is to provide the best chauffeured wine tours Melbourne can put forth. So whether it’s a soiree with the gang or just a two-person journey into the idyllic surroundings of the Victoria valley, we can make it happen without a worry in the world. We are also dedicated to giving you a personalized experience so let us know if you require any special seats, boosters, or pick-ups and we will ensure that your trip is as smooth and seamless as can be. While keeping affordability as the prime factor we make sure that your trip is as relaxed and happy as possible. But the most important thing to us is to keep you safe and on time. We make sure that the cars are clean and well-maintained and ensure the best quality. Punctuality is, of course, assured and you can count on us to make your journey a great one!